Just about everything has gone digital. Handing over a business card to a new business lead is no different. It just clicks or two away on your mobile device. In today’s tech-savvy world, there are apps that design, store and send digital business cards to other mobile devices. 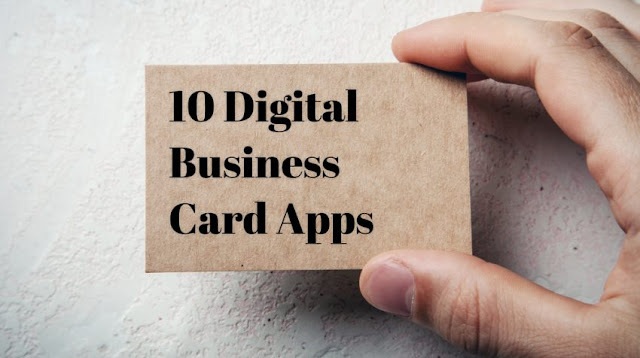 With digital business cards, you no longer need to rummage through a drawer overflowing with business cards to follow-up on a connection. These apps make it easier than ever to organize your connections. SnapDat is a free digital business card app that easily integrates with iPhone Address book. SnapDat business cards “SnapCards” can be shared though email or via the app. The app allows you to create multiple digital business cards for different purposes. And it’s convenient for both personal and business use. CamCard is among the best business card apps, and for a good reason. It is intuitive as it is able to read and scan cards in over 15 languages. It also allows you to import information from social media feeds. While you can try it for free, the app will set you back $5 per user per month for the Team package and $12 per user per month for the business package. Knowee offers several key features including, clickable links and thumbnails, an in-depth storage system, and you can also make direct calls from the card. The app has free Basic and Premium plans for a year, while the Business plan costs between 74 cents and $3.55 per user per month. This app allows you to manage your digital business cards in your app’s back office and create templates that you can deploy to your team’s smartphones. Inigo works with both Apple and Android devices. The standard version, appropriate for teams, is $5.49 per month, billed annually. A free version is also available. This is a modern business card solution that allows anyone to receive your cards even if they don’t have the app installed. Haystack also allows you to scan, share, update and store contact info with a simple scan of the card. You can also easily create your card from scratch. This app costs $4 per month for Premium plan and $199 per month for Enterprise plan. A Forever Free plan is also available. This application allows you to create digital business cards with a responsive design that’s optimized for mobile devices and a unique web page address. eVaunt also allows you to embed a Google Map, upload a profile photo as well as display social networking icons. This is one of the best electronic cards out there. The platform allows you to create a digital hub giving your customers the option to choose how they connect with you. For instance, you can have a small bio telling a little more about yourself. You can also have a video introduction as well as all your social networks in one place. OneCard has a free plan, but if you are looking for pro options then you will have to part with $12 per month or $120 per year. Available for both Android and iOS, this free digital business card app allows you to create, store and send your contacts to all interested parties. Clinck allows you to add a personal message, photo, logo or LinkedIn profile, together with clickable links to your website. Then there’s about.me which allows you to turn your page on the app into a shareable electronic business card you can send via email or your phone. You can share any combination of information from your about.me page including your email, phone number, photo and more. Your recipients can then save your details in their phone’s address book. This is a digital business card app that allows you to create a rich, dynamic presentations culled from your social media content. Icon automatically aggregates content from your business’ social feeds including networks like Instagram, Facebook, Twitter and LinkedIn. The app is available for both Android and iOS users.